This tutorial is to help you turn an existing cedar wood wall or ceiling into a weathered looking one. 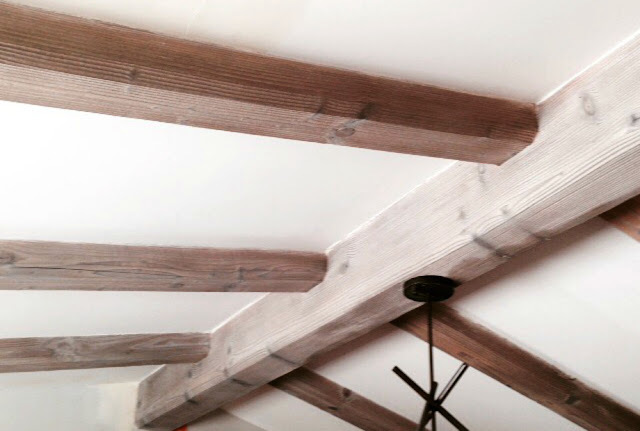 If you need instructions on applying wood to a wall or ceiling, check out this tutorial on installing DIY Barnwood Shiplap Wall. 1.] STRIP EXISTING FINISH: If your wood is brand new, jump to number 2!] 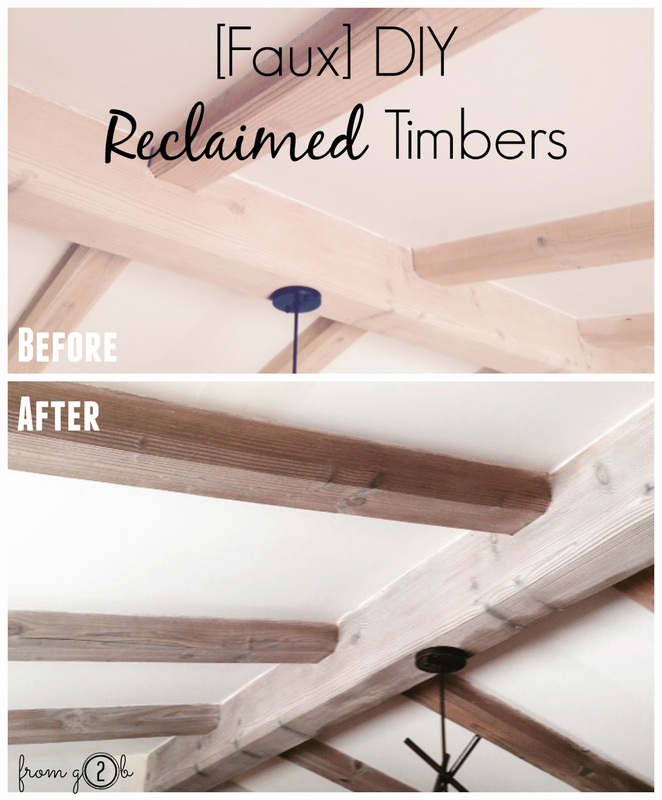 On this job, the red cedar ceiling has already stained with a white wash oil stain, but not a cool 2016 white wash, instead it was a dated 80's white wash. You can check it below. When the wood for this project had an existing finish on it, you should sand or strip it. Either use sand it with a low grit sandpaper like 80 grit and a palm sander. Or you can use a liquid/gel stripper like Citristrip to remove the existing finish. 2.] STAIN: When the wood is stripped down to raw wood, you can use an atomized gun to apply your stain. First, pour it through a strainer and then you can pour it into your atomized gun. You'll want to spray it on the wood in overlapping motions, making sure to drench the wood. 3.] For stain we choose Salvage stain from Weatherwood. This will give you a light weathered look, light grays and warm tones. The wood will dry in about 30 minutes, see in the below video. 4.] 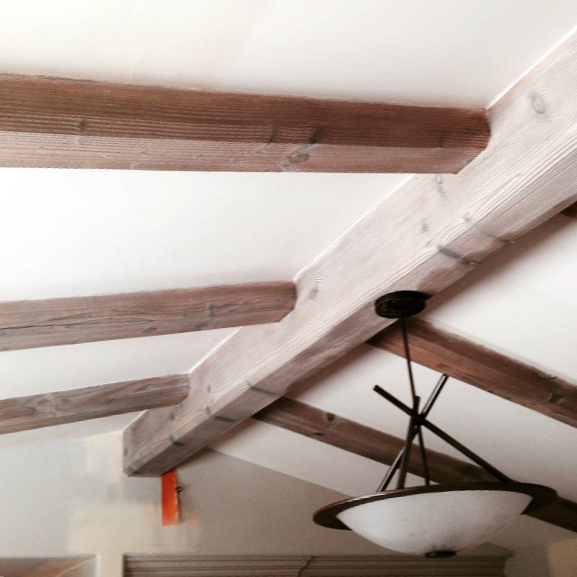 LIGHTEN & SEAL: For a ceiling, the wood doesn't need to be top-coated. Since this home is on the beach, the homeowners wanted the wood to be lightened slightly for that beachy look. So we applied White Maintenance Oil to add the look of patina to the wood. It's a wipe on and wipe off application. That's all there was to it. Just strip it and stain it, lighten or darken it and you're done. Just to refresh your memory, here's another "before." Didn't the ceiling turn out dreamy? I hope to see some photos when the rest of the space is complete. It's going to be amaze balls! If you have any questions, leave'm in the comments below.